Hunters of the Dusk - Darren Shan Wiki - The wiki about all Darren Shan books! 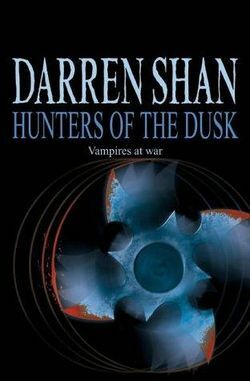 Chapters= Twenty (20) Hunters of The Dusk is the seventh novel in The Saga of Darren Shan and also the first book in the Vampire War trilogy. In the seventh book of this series, Darren is once again visited by Desmond Tiny (the creator of vampires and Little People). He says that the three hunters(Vancha,Mr.Crepsley,Darren Shan) must find and hunt down the Vampaneze Lord. He announces two of them (Darren and Mr. Crepsley). The third one they must find on their way. They leave and go to Lady Evanna for help. On the way Vancha shows up, declaring that he is the last hunter. He tells Darren that his former best friend is the Vampaneze Lord. They go to Evanna's house who lets them stay with her. She helps them locate the Vampaneze Lord in a nearby city. Darren sees her meeting with the Vampaneze Lord and tells the others. They go after him to try and kill him. They find what they believe to be the Vampaneze lord and kill him, only to realize he was a fake, the real Vampaneze lord escaped with Vancha's brother. After learning the truth Darren and co realise that they have also missed another chance to locate and kill the vampaneze lord. This page was last edited on 26 September 2012, at 13:29.